Jenoptik point sources are available in the UV, VIS or IR spectral range with or without pre-collimating optics. The LED point sources with pre-collimating optics provide a sharply defined and evenly illuminated reflection of their emission area. The LED point sources achieve maximum power densities with minimal electricity, which makes them an ideal alternative to laser beam sources. The red LED point sources emit at a wavelength of 650 nm and are optimized for energy efficiency. Depending on the point diameter, visible emission of red light is reached with a driving current of 400 nA. This guarantees extremely long battery life in mobile devices such as reflex sights. The smallest point diameter we offer is 8 µm, which can be used to achieve coverage of just one minute of arc (1 MOA). As a result, this point source provides a perfect aim at even very distant objects. Thanks to the very short switching times, you can also use the LED point sources for data transmission. Point sources with large point diameters are characterized by their high radiant intensity, making them ideal for use as light barriers. Point diameters of up to 150 µm are possible, depending on customer requirements. 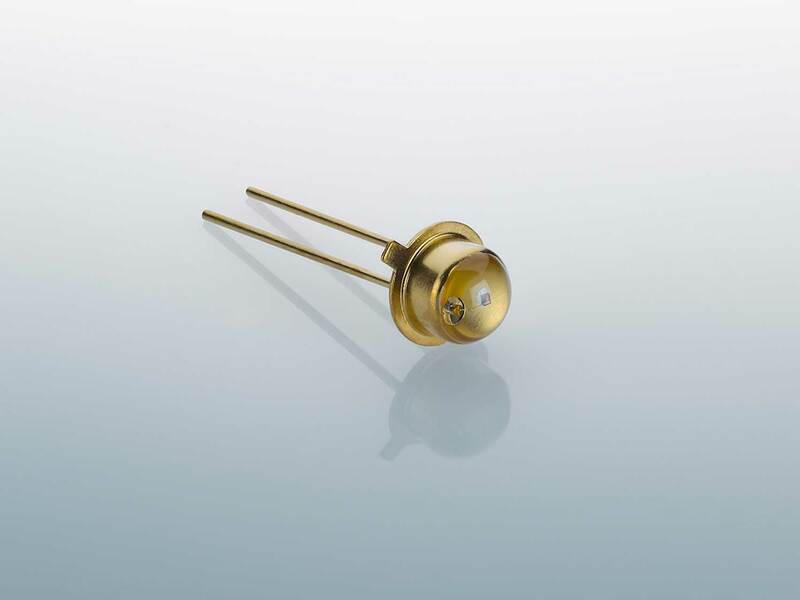 IR point sources were developed specifically for applications requiring high radiant intensity and maximum reliability. They operate with an emission wavelength of 850 nm and are available with point diameters of 25, 50, 100 and 150 µm. In contrast with conventional IR LEDs, point sources offer effective suppression of undesirable side radiation along with simple collimation. Due to these special characteristics, IR point sources are an ideal radiation source in optical rotary encoders. They also guarantee efficient coupling with optical fibers for data transmission. Our UV point sources are available with a point diameter of 60 µm or 100 µm with an emission wavelength of 360 nm. They offer precise collimation of the radiation along with a high power density focus. Our UV point sources are equipped with fully collimating optics in a TO housing and are ideal for sensor-based applications involving medical devices, such as for blood analysis and fluorescence microscopy. High-precision: sharply defined and evenly illuminated reflection of the emission area.